Darrell Webb has been an icon for over 20 years in bluegrass music, performing with the likes of the Lonesome River Band, J.D. Crowe, Rhonda Vincent and the Rage, lead vocalist and front man for Michael Cleveland and Flamekeeper. Darrell's stage presence and ability to entertain a crowd is unmistakable. One of his greatest attributes is being humble to the fans that support him and his talents are admired throughout the bluegrass community. The Americana Music area is currently featuring the Darrell Webb Band. Country-Cooperative is a set of companion sites designed specifically to service Indie musicians in the country, gospel, folk and bluegrass music genres. Country Cooperative offers self-managed listings and present our members to a 24/7, U.S. television audience of 4.2 million households. Hiltons, VA -- Darrell Webb is one of bluegrass music's favorite entertainers, and he has been an icon in bluegrass music for over 20 years. Many of his fans recognize his powerful tenor, lead vocals, and mandolin playing. 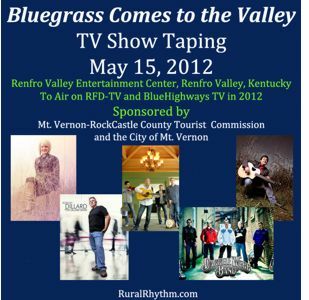 Webb first hit the bluegrass circuit with the Lonesome River Band. He later toured with J.D. Crowe and Rhonda Vincent. Darrell served as the lead vocalist and front man for Michael Cleveland and Flamekeeper. He has appeared on two releases with Dolly Parton as a singer and musician. In addition, he is a successful songwriter having songs recorded by the Lonesome River Band, Lou Reid and Carolina, and Wildfire. Darrell's first solo album Webbsite, released in 1998, received critical acclaim. His second album entitled Behind the Scenes, released in 2005, includes four songs he wrote/co-wrote. Special guests include two-time IBMA fiddle player of the year Michael Cleveland, IBMA dobro player of the year Phil Leadbetter, and Dolly Parton. Darrell will be doing a live recording from the Fold. Because of this, the concert will be one to listen to only event and there will be no dancing permitted. The show will also be videotaped for a live DVD recording. Come be a part of the excitment of a live recording. This special show at the Carter Family Fold will take place Friday, October 14, 2011. Darrell Webb says, "Welcome Jared Hensley as newest member of the Darrell Webb Band. Jared, who also goes by "Jayrod" will be filling the shoes of Asa Gravley who is taking some time away from the road. He is a student at East Tennessee State University majoring in parks and recreation management and minoring in bluegrass. He will graduate in 2012 and is currently working on his first solo album." In early spring 2011, The Darrell Webb Band went on location to a privately owned cabin in Bland, VA, to film their first music video. The featured song, "Miner's Hell" can be found on DWB's first release, Bloodline, which has made it through to round 2 of the IBMA Award voting process for Album of the Year.